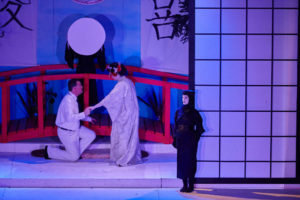 On the afternoon of Saturday, March 10th, Brooklyn’s Regina Opera, located in Sunset Park, and in its 48th season, presented a thrilling performance of Puccini’s Madama Butterfly. As soon as the house lights dimmed, we were suddenly in Nagasaki, Japan in 1904. Goro, a marriage broker, shows off a new house to American naval officer Lieutenant Benjamin Franklin Pinkerton who has just leased it for his upcoming marriage to Cio-Cio-San (Butterfly) the geisha. 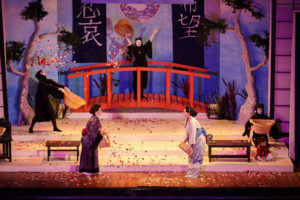 The translations for the wall hangings in each act are: Act One “Joy and Love,” Act Two “Sorrow and Hope” and Act Three “Horror and Death.” Three ladies in black represent Bunraku puppets and called Kuroko, are supposedly invisible to the audience and do everything from filling and serving a cup of tea, to handing Cio-Cio-San the knife that kills her. 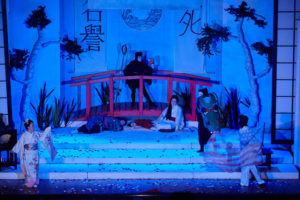 The stage was ablaze with action, color and mayhem. There were colorful umbrellas and brilliant costumes and we become acquainted with the characters. The composer Giacomo Puccini (1858-1924) and his librettists Luigi Illica and Giuseppe Giacosa witnessed an opening night fiasco on February 17, 1904 when the audience rioted. Puccini re-wrote Pinkerton’s part giving him an aria of “Remorse” (Addio fiorito asil), and making him a much more sympathetic character. Even today some audiences boo him because of his callous indifference to his young geisha bride, who converted to Christianity and could never accept the notion of his not returning to her. 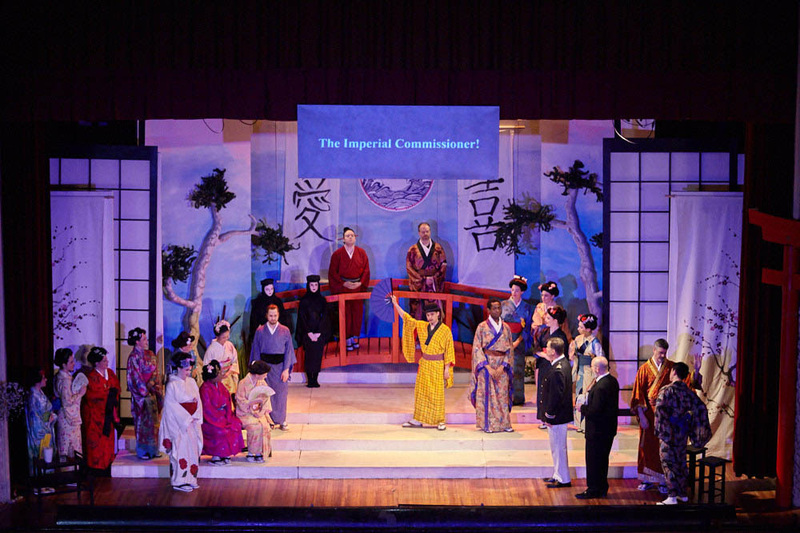 Puccini kept working on Madama Butterfly and came to America to oversee its premiere at the Metropolitan Opera House on February 7, 1907 with the immortal tenor Enrico Caruso as Pinkerton (1873-1921) and American soprano Geraldine Farrar as Cio-Cio-San. Both Caruso and Emmy Destinn sang Butterfly in Brooklyn at the Brooklyn Academy of Music (BAM) on November 22, 1910 with the Met on tour. Caruso and Farrar also recorded excerpts from the opera that are available today on CD. 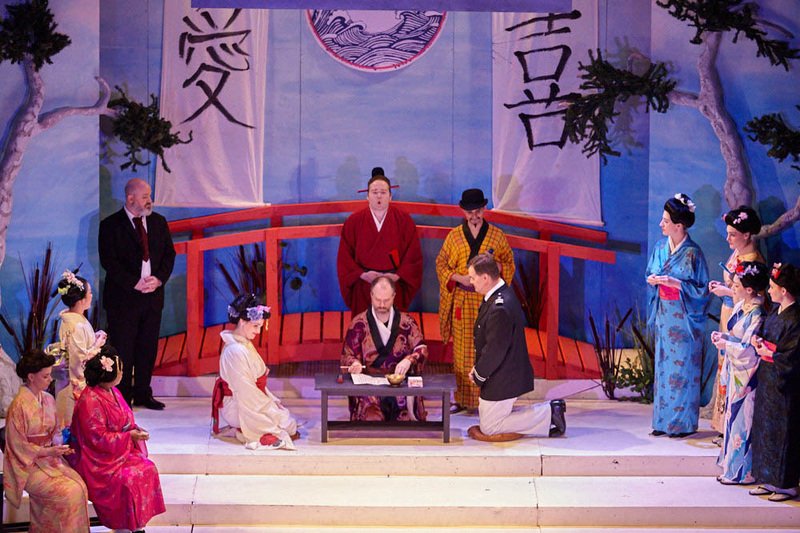 The beginning of the first act shows Lieutenant Benjamin Franklin Pinkerton of the U.S. Navy singing with U.S. Consul Sharpless “Amore o grillo dir non saprei” with toasts to Pinkerton on his wedding, with the horns playing the Star Spangled Banner. Kevin Rockover as Sharpless was afraid that Pinkerton was too frivolous towards the marriage and that his 15 year old bride might be taking it too seriously. Mr. Rockover sang with a truly fine manly baritone with warmth, prescience and diplomacy. Jerett Gieseler revealed a splendid American tenor (Eugene Conley’s name pops up) who also looked the part. His ringing tones in the National Anthem portions were quite exciting and I found it hard to believe that Gieseler was a baritone until recently. The great heldentenor and MGM film star Lauritz Melchior was a baritone for 6 years and a world famous tenor afterwards (1890-1973). Mr. Gieseler sang eloquently throughout with abundance of solid, easy ascents. His handling the very end of the love duet (Ah! Quanti occhi fisi) was fine; he sang with relative ease and held the final C with passion and ecstasy. In the third act, his remorseful “Addio fiorito asil” was quite touching although one never really believes it – especially when compared to the composers first version. Jerett Gieseler was a very credible Pinkerton with a very promising tenor career to come. 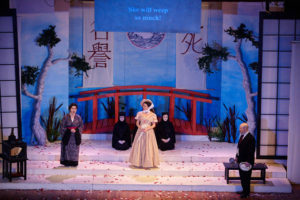 Cio-Cio-San (Butterfly), a geisha, was portrayed by soprano Megan Nielson. Her entrance aria “Ancora un passo” was sung with a lovely, stylish and youthful abandon as she and the wedding guests walked over the bridge with colorful umbrellas creating an image for the memory. In “Ieri son salita,” Cio-Cio-San reveals that she has embraced Pinkerton’s religion. All the while her voice denotes innocence, not using the “baby tones” of many past Italian Butterfly’s. Is her image to Pinkerton, she queries, of a butterfly pinned to the wall by her captor? 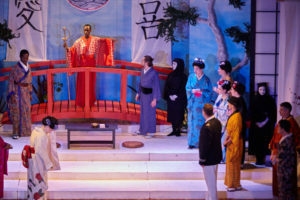 The Bonze, her uncle appears suddenly and denounces Butterfly for abandoning the religion of her ancestors. Kofi Hayford used his impressive basso to make his point and abruptly left the ceremony with family members. In “Bimba dagli occhi,” the famous love duet, Butterfly blended beautifully with Pinkerton and was swept away with his passion. They are finally united in love. Ms. Nielson’s voice was passionate and powerful and bright as a blossom. In Act 2, Pinkerton has been gone for three years and Suzuki, Butterfly’s servant, portrayed by Hannah Kramer, doubts he will return. Cio-Cio-San (Megan Nielson) then sings the iconic aria “Un Bel Di” Butterfly with the hope that the sweeter the voice, the heavier the despair. Her voice retained its sweetness until the finale, when, in a tsunami of passion, she ascended the higher notes of the finale and received an ovation. 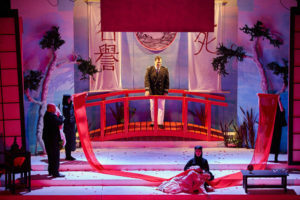 Sharpless was correct when he sang the words “Diavolo Pinkerton” just as Suzuki was when she sang “Povero Butterfly.” Sharpless seemed angry when Pinkerton was excited about marrying Cio-Cio-San who admittedly is only 15. (An old 15) as she stated. 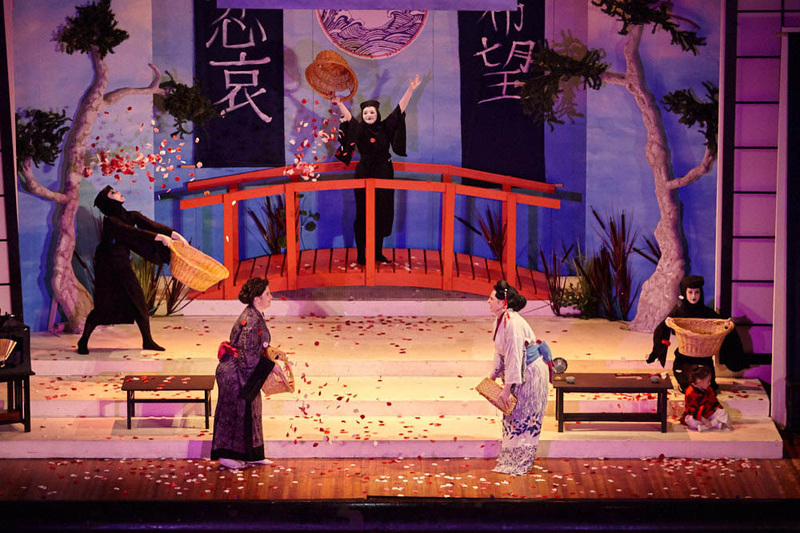 The famed “Flower duet” followed with Butterfly and Suzuki preparing for Pinkerton’s ship as it enters the harbor. As they sing the “Flower duet” and fill the house with blossoms, with “Sorrow” seated nearby, the vocal blend was heavenly. Ms. Nielson’s soaring soprano and Ms. Kramer’s luscious mezzo took us all to the land of milk and plenty from an emotional land of silk and empty. The gorgeous sounds of the Regina Opera chorus made that moment a sacred one. The final scene has a lovely interlude. 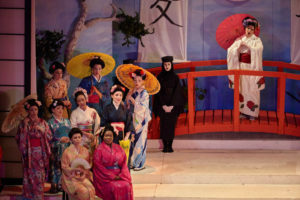 Alexandra Felipe, was the dream Bonze, Susannah Booth was the colorful dream dragon and Yoko Yamashita as the beautiful and graceful dream Butterfly. Maestro Gregory Ortega and the Regina Opera Orchestra took us on an incredible journey! There was a large transparent American flag and so many dazzling dreamlike images. 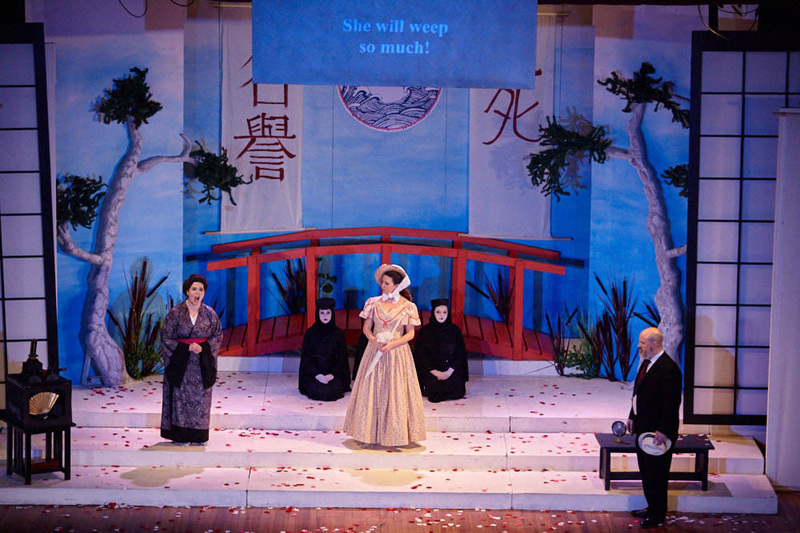 The last act has Pinkerton returning with his American wife, Kate, sung by Mary Gwynne Langston, who have come to Japan to adopt “Sorrow”. Pinkerton and Sharpless sing a dirge-like melody, haunting and sad. Butterfly meets Kate briefly and then rushes inside to be with Sorrow. Pinkerton sings his “Addio fiorito asil” with tenderness and thrilling high notes, and runs off. 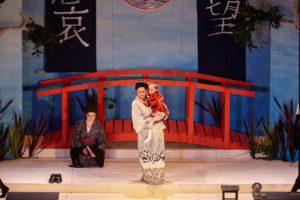 Butterfly blindfolds Sorrow and quotes her late father’s suicide note.”Better to die with honor than live with dishonor.” The Bunraki give her the knife and wrap her in red – the deed is done, with the red banners shimmering as Pinkerton runs toward the dead Butterfly calling her name. A huge discord note with the Death theme ends the opera, which was followed by an ovation from the emotional and deeply moved audience. The other characters who deserve very honorable mention: Tai Collins was a robust voiced tenor and dynamic animated Goro; Prince Yamadori, a suitor, was in the patient, versatile, and comical hands of dark voiced Grant Mech; Kate Pinkerton, Mary Gwynne Langston, was touching in her brief but imposing role; Thomas Geib was an able Imperial Commissioner, with Davis Tillistrand as the Registrar, and adorable Sabrina Seweryn as “Sorrow”. Special plaudits to the Kuroko: Wendy Chu (Dream Pinkerton), Alexandra Felipe (Dream Bonze) and Susanna Booth (Dream Dragon). 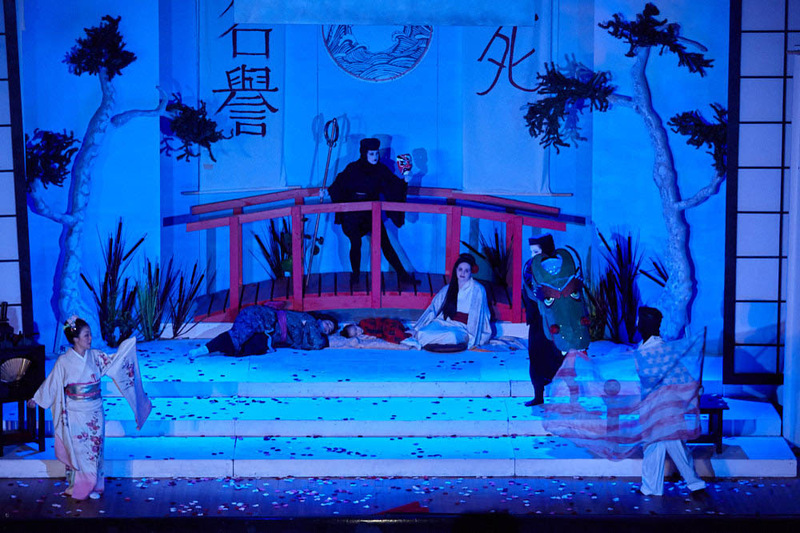 Saori Morris’ make up and wig design was fabulous! Credit goes to Jahn Visone, an excellent make-up artist, and Yoko Yamashita a wonderful – Japanese movement consultant. It was so nice to see the lovely and familiar faces of Cathy Greco and Shelley Barkan from the ensemble, among the Choristers and actresses who are such a vital part of the scene. Kudos to President and Producer Fran Garber-Cohen, Linda Cantoni (who provided the supertitles), and Principal Stage Director Linda Lehr, who brought us a magnificent and brilliant slice of life from the past that still breaks the heart and thrills the soul, in a new and special way. Compliments go to Marcia Kresge’s magnificent and beautiful costumes, and to Regina’s Vice President Elena Jannicelli-Sandella, whose publicity helped to fill the theater. Many a person emailed me saying it was one of the very best Madama Butterfly’s ever – unforgettable and vibrant! Bravo Regina Opera! Here’s to their first Aida in May. Fabulous presentation. Loved every minute. Looking forward to Aida!! !